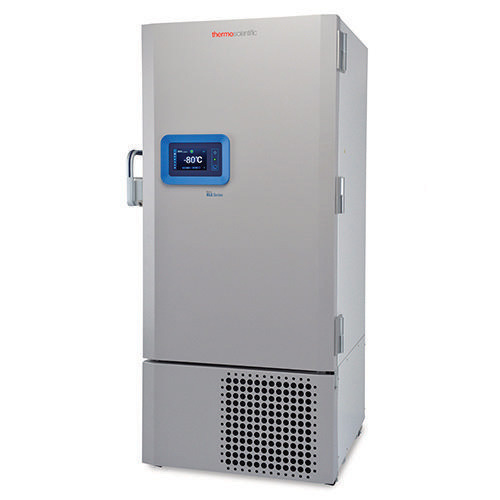 Thermo Scientific Revco RLE Series Ultra-Low Freezers provide dependable -80°C storage with energy-savings and sustainability features. Quiet enough to reside directly in the laboratory. At just 50 dBA, the sound is comparable to a home refrigerator. 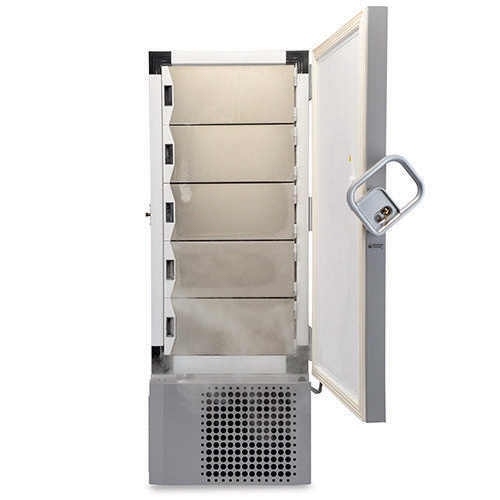 Includes 5 racks (item 398329) and 100 boxes with 100-cell dividers. Fills an entire shelf allowing for storage of 10,000 tubes/vials. Part Number CR4567. Chart recorders maintain accurate, physical temperature on chart paper. Includes one box of 50 charts. Installed at factory; must be purchased with freezer. Part Number CRP4567. Chart recorders maintain accurate, physical temperature on chart paper. Includes one box of 50 charts. Installed at factory; must be purchased with freezer. Part Number LN4567. Maintains temperature down to -80 degrees Celsius with liquid nitrogen. Installed at factory; must be purchased with freezer. Part Number CO4567. Maintains temperature down to -70 degrees Celsius with CO2. Installed at factory; must be purchased with freezer. Part Number RAC34567. Proximity card access control allows for enhanced security. On-board computer records who opened the door, when it occurred and for how long. Includes five key cards. Part Number ACU34567. Includes five replacement key cards for the RAC34567 Access Key Option. Part Number 17020. Replacement chart paper for your ink chart recorder. Pack of 50 charts included. Part Number 400159. Please note that this battery back-up is for the onboard control system and alarms, not for the entire freezer. LN2 or CO2 backup systems are required to keep the freezer cold. Part Number 6903. The alarm delay eliminates nuisance alarms due to intermittent or transitory conditions such as lightning or brief power outages. The adjustable delay requires an alarm condition to exist continuously for a pre-determined time (adjustable) before a signal is released to a central alarm/monitoring system or telephone dialer. Part Number SK500. Includes one stainless-steel shelf and clips.